LAKE CHAD IS A shallow freshwater lake located in west-central Africa. Only 23 ft (7 m) at its deepest, it is 820 ft (250 m) above sea level, and was once larger than the state of VERMONT. In the 1960s, Lake Chad was approximately the size of lake ERIE, one of the Great Lakes located in the Midwest region of the UNITED STATES. 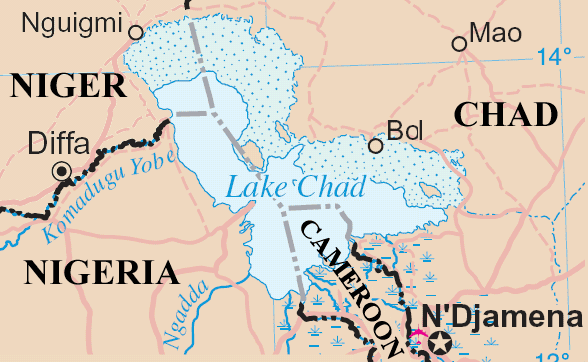 In the past 40 years, however, Lake Chad has shrunk to less than the size of RHODE ISLAND. Reasons are twofold: a drier climate, with less water replenishment by monsoons; and water siphoned off for agricultural irrigation purposes has quadrupled to provide for the 20 million people living in the four countries (Chad primarily, but also CAMEROON, NIGER, and NIGERIA) that include Lake Chad in their borders. To illustrate the lake’s reduction: Its surface area measured 10,000 square mi (25,000 square km) in 1963 but had shrunk to 839 square mi (1,350 square km) by 2001, causing the lake to become one-twentieth of its original size. The most significant decrease occurred between 1973 and 1987. Still, Lake Chad is the fourth-largest lake in Africa, with only Lakes VICTORIA, TANGANIKA, and MALAWI superior in size. It is a central point of the region for many reasons, including the important archaeological discoveries found nearby. This region contains some of the earliest evidence of hominids; the area has been occupied, nonstop, since perhaps 500 B.C.E. Other pivotal roles of the lake and its perimeter include the area’s prominence in the region’s trade, the massive irrigation projects that rely upon its waters, and the flora and fauna that grow—and the wildlife that live—nearby. Fish quantities, however, are significantly decreasing, a concern since fish provide a source of protein for the population. Because of the decrease in fish, along with other signals of environmental distress, the lake and surrounding basins have been declared a “disaster zone.” A research paper exploring the devastation, “Human and Natural Impacts on the Water Resources of the Lake Chad Basin,” appeared in the American Geophysical Union’s Journal of Geophysical Research in 2001. Britain’s Department for International Development in Nigeria, however, offers a more optimistic outlook. According to their experts, the shrinkage of Lake Chad has created more farmland, land that is fed by the lake when its boundaries expand during rainy weather. Leftover fish manure fertilizes this farmland, adding to fertility, and this combination allows farmers to survive three-month drier periods. Significant famines have not occurred in this region, and people living by the lake are effectively fed by agriculture.